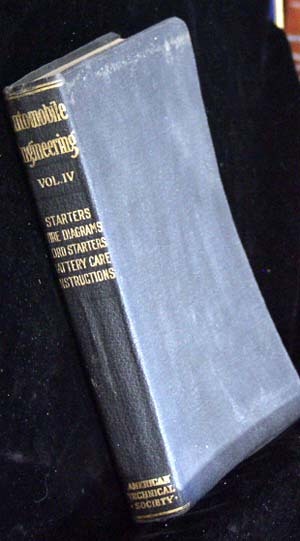 Automobile engineering; a general reference work: For repair men, chauffeurs, and owners, covering the construction, care and repair of pleasure cars, commercial cars, and motorcycles, with special attention to ignition, starting and lighting systems, garage design and equipment, welding and other repair methods. Prepared by a staff of automobile experts, consulting engineers and designers of the highest professional standards. Illustrated with over 1,500 engravings. Chicago: American technical society, 1920; 6 v. fronts., illus., plates, diagrs. 22 cm. Excellent condition, flexible black covers with gold stamping on spine.